A world-class education wherever there's internet. Rising costs and strict admissions requirements make traditional higher education inaccessible for many students. In fact, the cost of attending a public four-year university has increased by 3.1% (beyond the cost of inflation) in the last 10 years. The amount of student debt is also a rising concern as it recently topped $1.5 trillion. Whether it’s a high school student who doesn’t have access to much federal student aid or an older adult who has already entered the workforce and can’t afford to quit his or her job, many people may feel like they don’t have a lot of choices: Make a huge investment in college and hope you aren’t one of the 25% of college graduates who are underemployed, or limit your potential by not getting your degree. Thankfully, a third option is emerging in the form of Massive Open Online Courses (MOOC for short). While a certificate from a MOOC isn’t the same as a college degree, MOOCs are providing access to world-class education to anyone with an internet connection, which opens up a world of possibilities. For instance, a high school student can take a MOOC that allows them to determine which career path is right for them (before wasting time and money on a degree that they can’t or don’t want to use). Additionally, those who can’t afford to quit their job to go back to school to further or change their career path can take MOOCs in their free time. MOOCs are provided on a number of platforms, but not all platforms are created equal. For instance, one of the platforms we reviewed gives you access to 52 MOOCs, while another has a robust selection of more than 3,000 MOOCs. We looked for the best MOOC platforms with the highest quality courses and teachers, the widest variety of available courses, and those that offer the most specializations. Coursera emerged as the top ranked MOOC platform and the best overall choice due to its impressive selection of learning pathways and course features. We also found edX and FutureLearn to be strong programs. In addition to covering the basics of MOOCs, we will take an in-depth look at our top three platforms and explain our methodology for choosing and ranking MOOC platforms. We will also discuss four ways for students to use MOOCs effectively and three ways for teachers to use MOOCs to help their students succeed. Online colleges have been around for quite a while, and they are widely understood and utilized. However, MOOCs have only been around since 2012 (many consider the aforementioned course taught by Dr. Thrun to be the first real MOOC), and many people either don’t know what they are or assume they are similar to online college classes. Before MOOCs came on the scene, there were two other basic types of distance learning: OpenCourseWare (OCW) and online college classes – both are at opposite ends of the spectrum. OCW is basically just a publication of an institution’s course material online. The material can be used by anyone and even edited (as long as proper attribution is made). Many consider OCW to be the predecessor to MOOCs as they share the same goal of making quality education accessible to everyone. Conversely, online colleges provide a structured university class online. The students must be enrolled in the university and are paying tuition and receiving grades as they would if they physically attended the class. 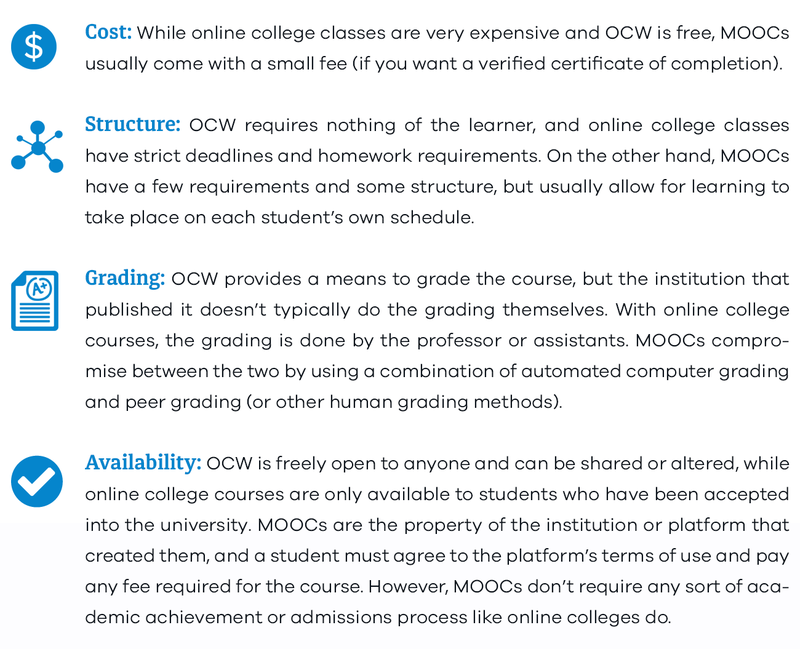 Enrolling and taking a MOOC can be broken down into five steps. Like we mentioned earlier, not all platforms provide the same quality of MOOCs. For instance, there were 19 platforms that we considered, and only six survived the cuts. Of those six, only three stood above the rest after our evaluation. It’s a good idea to compare MOOCs between the top three we recommend and find the courses that fit your needs. Signing up for an account is a free process – all you need is an email address. Keep in mind that some platforms may require a subscription to access certain content. For instance, if you want to take a specialization (a group of MOOCs) from Coursera, you will need to provide payment information, and you will be charged monthly at the end of a free trial. Audited Course: You can audit a course to learn for your own benefit. Auditing can typically be done for free, but don’t expect to receive a certificate (definitely not an ID-verified certificate). In this scenario, finishing the course isn’t always important as you may be taking the course simply out of curiosity or for the fun of it. Certified Course: This approach involves completing a specific course to receive a certificate (verified or unverified). Since there’s usually a monetary investment, completing this course is more important, and you won’t gain any certification if you don’t. Specialization: MOOCs offer specializations (or learning pathways) that consist of a series of courses. If you successfully complete the specialization, you will receive a special certification (although some platforms require you to pay for the certificate). MOOCs can either be scheduled (meaning there’s a start and end date) or “on-demand” (meaning that you can learn on your own time and at your own pace). Scheduled courses may require assignments to be completed by a certain date or time, while on-demand courses can be stretched out over a long period of time. Whether your intention is to fully complete the course or not, our top three recommendations usually allow you to do the work on a desktop, tablet, or smartphone. 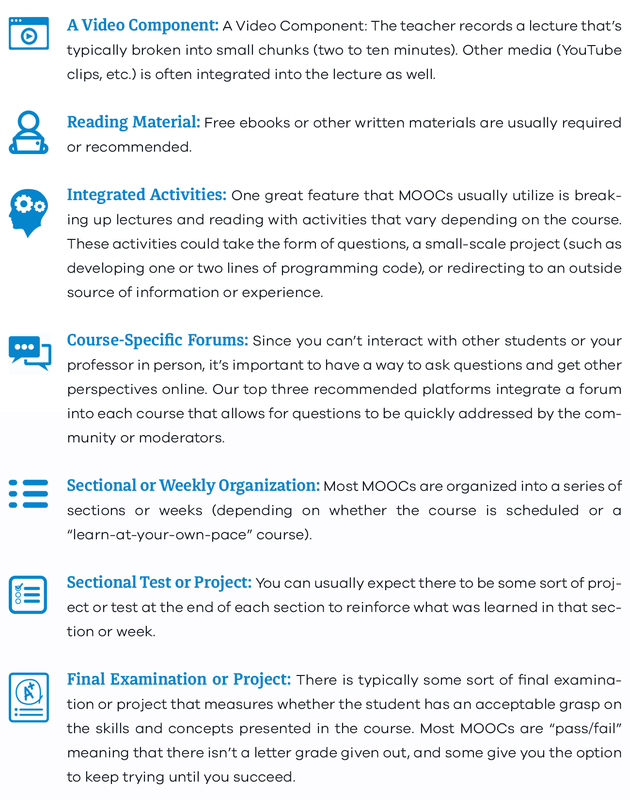 The first step in finding the best MOOC platforms was to develop a list of contenders. We found 19 platforms that were based in 5 countries. From there, we eliminated 13 platforms that didn’t meet our high standards. For an in-depth look at all of our metrics and a detailed explanation of our scoring methods, you can read our full methodology and metric walkthrough. Does the platform offer verified certificates? Does the platform offer completion certificates for all courses for free? How many courses are offered with the ability to gain college credit? How many learning pathways or specializations are offered? How many accredited degrees can be earned? How many search filters does the platform have? How many categories of courses are there? Is there both automated and peer (or other human) grading? How many languages are video subtitles available in? Is there a fully functional mobile app? Is there a course ranking or review system? Does the platform have social profiles? Is there a recognition and reputation system for users who contribute to the community? Is there a system that allows students to learn together? How many partner institutions does the platform have? How many courses are provided by partnered institutions? What is the comparative ranking of the platform’s partner universities? Each sub-metric that was a “yes-or-no” question was given a “10” or a “0.” Sub-metrics that were comparisons were assigned scores between “0” and “10” – those that performed the best were given higher scores. The average of all of the sub-metrics under a single core metric was determined for each platform. Each platform was then assigned a value between “0” and “10” based on its average – the higher the sub-metric average, the better the score for that core metric. MOOC platforms each have unique ways of monetizing their courses, so we couldn’t adequately compare cost between platforms. For instance, some charge a monthly subscription fee, while others provide some free courses and charge a fee for those that are more popular or for “specializations.” There are even some that allow you to audit the course for free, but you won’t get any sort of certificate without paying. Whatever the pricing model, MOOCs are almost always an order of magnitude cheaper than equivalent courses at a university. For instance, a full course in VR from Udacity costs $1,200, while studying for a graduate degree from Stanford could cost upward of $30,000 in one year. Of course, the value of a Stanford degree would be higher than a certification from Udacity, but the comparison in price shows how relatively inexpensive MOOCs typically are. Paying for a MOOC isn’t always a bad thing because those who pay for a course have a tendency to be more engaged in the material. Additionally, those who pay also tend to have lower dropout rates than those who don’t. Traditionally, critics of the MOOC model have pointed out the astronomical dropout rate for MOOCs. A retention rate of 10% is widely cited which means that 90% of those who sign up for a MOOC don’t earn a certificate of completion. For those reasons, we decided that completion rate isn’t a useful indicator of a MOOC’s quality. This guide focuses on ranking the platforms, not the individual courses. It’s important to note that one course on a platform that didn’t score well overall may be of a higher quality than another course on a different platform that ranked near the top. We measured whether the platforms provide students a way to rank and review the courses that they have taken. We looked at whether the platforms have integrated course-specific forums where social interaction can take place and questions can be answered by the community. We also gauged the overall quality of the instructors by identifying how high each platform’s partner universities ranked worldwide, which you can read about in our full methodology. Coursera’s main advantage is scale – it has the most MOOCs, the most learning pathways, the most partner institutions, and offers the most languages. Coursera’s partner universities also have the highest cumulative rank. The only other platform that is providing MOOCs on Coursera’s scale is edX. For instance, Coursera has 3,069 MOOCs, edX has 2,232, and the next closest platform only has 532. Coursera placed first in core metrics such as Social Features and Course Features, and came in a close second to edX in Course Diversity. The platform has six search filters (the same as edX), although it only offers courses across 11 academic categories, while edX offers courses across 20 categories. Another downside is Coursera’s lack of consistency with pricing. Coursera’s current pricing model allows the institution and instructor that offers the course to determine the cost – prices range from $20 to $200. You can “explore the course material” for free, but may not have full access to certain course features like graded assignments. Most specializations require a monthly subscription which can range from $39 to $89 a month (there is an option for a free trial for seven days). Coursera is a for-profit company that was started by Stanford computer science professors Andrew Ng and Daphne Koller in 2012. The two professors first offered Stanford courses online in 2011 and were so inspired by the experience that they decided to start a company that offers MOOCs. The platform currently has 25 million registered learners and partners with 149 universities across 29 countries. If you’re looking for a broad range of MOOCs, we recommend edX. The platform offers courses across 20 different categories of academia which is four more than FutureLearn. Most other platforms tend to focus on courses relating to technology, so if you want to take a course like “Ancient Egyptian Civilization,” edX is your best bet. The biggest problem with edX is that it only offers 8 accredited degrees which is less than Coursera’s 12 and FutureLearn’s 24. We also found its social features to be subpar. Coursera and Udacity both have a reputation system, which rewards and recognizes students who positively contribute to the community – edX noticeably lacks this type of feature. The fee structure for edX is similar to Coursera’s. You can audit courses for free, but you won’t have access to the whole experience. You don’t get any sort of certificate for finishing a course you audit, so you’ll have to pay a fee if you want to show off your progress to your peers or employer. A nonprofit company that was founded in 2012 by Harvard and MIT, edX currently partners with top institutions all over the world. One aspect of edX that makes the platform stand out is that its technology is open-source – this means that partner institutions can improve and add features that benefit the audience they are trying to reach. Best for: Those that are pursuing accredited degrees and college credit online courses. While it doesn’t have nearly as many as Coursera or edX, FutureLearn came in third offering 532 courses. However, where this institution really stood out was the number of accredited degrees offered: 24. That’s twice as many as Coursera and three times what edX offers . The path to earning these degrees through FutureLearn is also flexible and affordable with a pay-as-you-go model. While FutureLearn doesn’t offer quite as many course categories as edX, it does offer 16, which is five more than Coursera. This allows for a broader appeal in its course offerings and greater diversity in the education it provides. FutureLearn is a private company owned by The Open University. The university was established by Royal Charter by Queen Elizabeth II in 1969. As a result, FutureLearn benefits from more than 40 years of the university’s distance learning and online education experience. In some ways, MOOCs are revolutionizing the way higher education is delivered, but they do have some downsides. For instance, the dropout rate is extremely high (somewhere in the neighborhood of 90%), and credentialing is an issue. Traditional degrees are universally accepted and open the door to rewarding careers with much higher compensation. Conversely, a MOOC certificate that shows the bearer completed a course or learning pathway doesn’t provide the same benefits in many cases (it isn’t equivalent to an accredited degree). That being said, a self-motivated learner can overcome these obstacles if a good strategy is put in place. It’s important to clarify what your goal for taking MOOCs is ahead of time and put a plan in place to complete it. Below, we will share three pieces of advice that are universally applicable, and after that we will discuss four ways to use MOOCs effectively. It’s important to remember that just because we ranked one platform higher than another, doesn’t mean that the individual MOOC or specialization that you are interested in will necessarily be superior. A wise course of action would be to compare a similar course between our top three recommendations. Find someone who will take the course with you. The right partner will allow both of you to keep each other accountable for the progress that you are making. Participate in course-specific discussions on the provided forums. If you are feeling discouraged or frustrated by a specific topic, make sure you reach out for help – don’t give up! Investing a small amount of money may help you to follow through with completing the course since you’re invested monetarily. 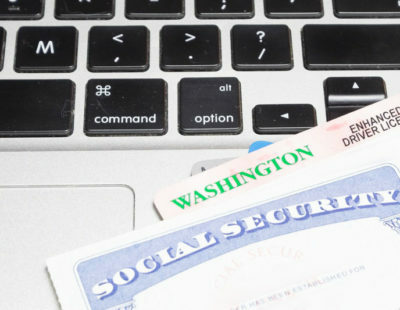 According to a Harvard study in 2015, 50% of students opting for a verified certificate completed the course, while only 5% of students who didn’t pay for the ID-verification received a certificate of completion. Of course, you still can audit many courses for free if you are simply indulging your curiosity, but if your goal is to complete the course and have something to show for your effort down the road, investing in an ID-verified certificate may be well worth the cost. MOOCs can be a valuable tool if you want to advance in your career or get a different job (whether it’s a slight adjustment or a different career path altogether). One of the biggest upsides with MOOCs is that you don’t have to quit your job or take a leave of absence like you might need to if you went back to school full-time. Unlike night classes or full-fledged online college courses, most people can add a MOOC into their current lifestyle without making a huge adjustment. All of our recommendations allow students to take the course on a mobile app. This kind of flexibility enables you to watch lectures and complete some coursework on public transportation on the way to work, for example. Overall, one of the big reasons to try using MOOCs is the small investment required which gives many of those who can’t go back to school a legitimate alternative. Take a look at the practical advice laid out below if you are considering using MOOCs to secure a promotion or switch careers. The direct approach is to go to your employer and outline the reasons why you should be considered for the promotion or advancement. While you do need to include job performance and other reasons why you should be considered, you should also spend a considerable amount of time outlining the skills and knowledge you gained by completing the MOOC or learning pathway. Present your certificate and make sure your employer understands the effort you took to complete the course. If nothing else, your willingness to proactively grow your knowledge and skills should impress your employer. Taking a MOOC or series of MOOCs can also have an indirect impact on your career. The skills you’ve learned may allow you to take on more responsibilities or increase your job performance. Even if you never bring it up yourself, your employer may see your progress and choose to promote you. Completing a MOOC can be a huge part of getting a promotion and advancing your career if you correctly maximize and leverage the skills you learned by successfully completing a MOOC. In addition to presenting a certificate of completion, consider what type of tangible project or quantifiable growth you can utilize to demonstrate the value of what you’ve learned. If you know that you want or need a change in career, but don’t know exactly what you want to do, you can explore multiple careers by completing a variety of MOOCs without a huge investment in a single career path. Once you’ve chosen and completed the courses or learning pathway, you can use your resume to get a leg up on fresh graduates who have little or no job experience. One way to get your leg in the door with a company is to get creative with a tangible side-project that you can use to add credibility to your MOOC certificate or degree. Be sure to invest in a verified certificate or some other sort of certification, and be prepared to explain what a MOOC is and how widely it’s used and accepted. Your employer or prospective employer may have never heard of a “MOOC” before. Consider including an authoritative link (like this one) in your digital resume. MOOCs can be used to make traditional college more affordable by earning low-cost college credit, but the process will take some work, and you will need to be self-motivated. There are two basic ways to use MOOCs to earn college credit. The first way is to complete a test like the CLEP, and the second way is to take MOOCs that partner with universities to offer college credit. CLEP stands for College-Level Examination Program, and it’s designed to test whether a student has the proficiency with a subject that’s equivalent to what one could expect to have after completing a semester’s worth of college classes (in some cases it’s a year or two of knowledge that’s being tested). The CLEP has a limited number of subjects that can be tested and they are mostly prerequisites. Credit isn’t given out by CLEP itself, but it’s accepted in some form by almost 3,000 institutions which in turn grant the credit. The cost is $85 per exam (after July 1st, 2017). The College Board is the largest CLEP provider, and you can register on their website. It’s important to note that you can’t take the CLEP online – you must schedule your CLEP at a physical location. There are other ways to prepare for the CLEP, but MOOCs are a helpful tool in this process. Most platforms will require some work to find MOOCs that cover the topics on which you are being tested. That being said, Edevate has a program specifically designed to prepare for CLEPs. Several MOOC platforms offer courses that are accepted by certain universities for college credit. An example is the MicroMasters Program offered by edX. There are 35 programs, and each can be transferred to one or more universities for college credit. For example, consider the Software Development MicroMasters Program. It costs about $1,000, and if you are accepted by Curtin University for their Master of Science Program, you can receive 100 of the 400 credits required for the degree. While you may not be able to use MOOCs to actually reduce the amount of money you spend on college, you may be able to use MOOCs to get the most out of your degree. After all, college is most likely the biggest investment you will make until you buy a house – and while you can sell a house down the road, you can’t take your degree back and get a refund. The first way a MOOC can help you prepare for college is by helping you know what you’re getting into. Many students change their majors multiple times, which wastes time and possibly money. Others decide to go back to college after not getting a job or not liking the job they have. MOOCs can help you understand what it takes to get the degree you are interested in, and they can give you a better idea of what a job in your career path would look like before you invest thousands of dollars in a college degree you may not use. Additionally, taking MOOCs before college can help you get better grades in class, which can result in getting accepted into a desirable graduate program. Better grades may also make you more desirable to recruiters. Also, keep in mind that as more and more employers are exposed to MOOCs and understand their value, they may become more of an asset on your resume when combined with your college degree. Even if your prospective employer doesn’t accept or understand the validity of your certificate, the certificate can give them confidence that you are dedicated and serious about your career. AP Classes can be a great way to prepare for college, but students who can’t or don’t want to go that route may need to prepare for college differently. Many students think that a certain career sounds interesting, and their teachers and parents are pressuring them to attend college, so they choose a major with very little knowledge or preparation. MOOCs can help students figure out what career would be the best combination of what they are passionate about or interested in, and what they are naturally skilled at. A high school student who loves video games might think that becoming a video game developer would be an “awesome career,” but taking a MOOC like “Introduction to Programming” could help him or her understand what’s involved and whether he or she would actually want to pursue that type of career. The first tip is this: Stay engaged and finish what you start. Learning isn’t always fun or easy, but thankfully, many MOOCs are taking strides (like gamification) in making their content more engaging. The beginning and end a course isn’t usually too difficult, it’s the large part in the middle that derails many students taking MOOCs. It’s wise to commit to a course and finish it to get an accurate picture of whether that subject is one that you might want to pursue further. Starting 20 different courses and never finishing one won’t effectively prepare you for college – it might hurt more than it helps since it might give you the mentality of “well, I tried that, and it just wasn’t right for me.” There are many activities and situations in life that aren’t particularly fun at first, but once you push through and become moderately skilled, that activity may become enjoyable and rewarding. The second piece of advice is to develop a plan for when and how much you will study the course and stick to it. Just because you may be taking the course and have little or no money invested in it, doesn’t mean you should approach it any differently than you would a college class that you paid a lot of money for and are getting strictly graded on. Finally, don’t do it alone. Try taking the course with a couple of friends with similar interests – this can add an element of competition and mutual accountability. If you don’t have someone to take the course with, try asking someone you respect to help you follow through with your plan. You may also be able to develop a friendship with someone you meet online who is taking the same MOOC as you. First and foremost, it’s important to understand that this approach isn’t right for everyone. College degrees are still very valuable, and if you can get a lot of scholarships and grants, they may still be a better choice. There are many career paths (like a medical career) that require a traditional college degree and hands-on training. You also need to consider that if you take this approach, it may not work out for you – you might complete a bunch of MOOCs and never be able to find the job you want. You may still decide later on that you need to go to college. Keep in mind that if you try this approach and fail, but in the meantime start a family, buy a house, etc., it might not be feasible for you to go back to college. The beauty of this approach is that there’s much less to lose if you try using MOOCs to get into a specific career and fail, than if you spend a ton of time and money on a college degree and can’t find a job. It’s important to remember that even if you get a college degree and find a job, you might not actually be using your degree. According to this study from the Urban Institute, 25% of college graduates are underemployed – meaning that they are in jobs that don’t normally require a bachelor’s degree. Note: The following is a step-by-step method that may or may not work for you. There are many factors to take into account, and your approach should depend a lot on your individual circumstances. This next section is written to spark ideas and alternative methods to consider and try – there is no guarantee that this strategy will be successful for you. While there’s a lot that goes into being successful in a career, taking personality and career assessments can help you discover what you may be good at. However, remember that these usually aren’t 100% accurate – use these to gain insights into what you value and may be skilled at. Explore careers that you think you would enjoy or that would be fulfilling for you and for which you have an aptitude. For example if you love nature, investigate jobs that involve working in the outdoors, and if you are skilled at understanding the details of how things work, consider becoming some kind of engineer. You can use free MOOCs to investigate career paths in more depth. Also, try finding specific job descriptions you are interested in on sites like Indeed and Glassdoor – this can help you understand what would be expected of you and what employers are looking for. A specialization is a group of courses made up of a number of individual MOOCs. Specializations usually require a relatively small fee and award a unique certificate at the end. A specialization or learning pathway is MOOC platforms’ version of a degree. Coursera’s Specializations: Coursera has more than 180 specializations, which is the widest variety available. A monthly subscription is required to enroll in these MOOCs. edX’s Specializations: edX has five different kinds of specializations. The first is its MicroMasters Program, which is designed to stand alone as a valuable credential, or it can be used to earn credit towards a Masters Degree. The second type is Professional Certificates – these are designed by top companies or universities to advance your career and are specifically designed to teach job-related skills. Next is the Online Master’s Degree, where you can take accredited courses from top universities. The fourth type is the Global Freshman Academy, where you can earn transferable Arizona State University credit. The last type of specialization is edX’s XSeries Programs. These specializations are designed to increase your knowledge in exciting or in-demand fields. FutureLearn Programs: The programs offered by FutureLearn fit our criteria for Specializations because they’re groupings of courses designed to launch you into a specialized career. With these programs, you are able to learn for free or pay to upgrade and gain access to additional features like access to tests and certificates. This is where you have to get creative – you are trying to create something that will intrigue an employer enough to give you a chance. One way to accomplish this is to design or build something that has value and shows off your abilities. Think of other ways to show that you have not only learned about the career, but that you already have practical experience with something that will add value to your employer’s company. Leverage your experience or showcase project to land an internship or entry-level job in your chosen career. Keep in mind that you may have to apply for dozens of internships since not all employers will even know what a MOOC is. You can use an internship platform to make your search easier. Remember that this only works if you perform exceptionally well in your internship or entry-level job. You also have to find an employer that puts a higher value on actual results than on formal education. Once you have a job, you can continue to take additional MOOCs that will develop your skills further. At this point, you can use the strategies discussed above to use MOOCs to advance your career. Teaching isn’t easy, especially at the high school level. If the goal is to help students engage in what’s being taught and prepare them for college, there are many challenges to overcome. Thankfully, there are new tools that are being developed that can help teachers to overcome some of these challenges. One of these tools is using MOOCs in a high school classroom. There are MOOCs that are specifically designed by Universities to bridge the gap between their courses and high school. Teachers who use MOOCs as a tool (among other teaching tools) to engage their students with a different method of learning can expose their students to the idea of being a self-motivated learner. It’s also a unique opportunity for high school students to interact with other students from around the world through the course forums. A specific example of MOOCs that can be used for this purpose is the selection of MOOCs offered by edX. Partnering with Microsoft and universities like MIT, edX has created MOOCS that are specifically designed to bridge the knowledge gap between high school and college, to help students prepare for AP and CLEP Exams, and to provide introductory courses on a high school level. The first way teachers can use MOOCs to help their high school students learn and succeed is to allow students who are struggling to take a MOOC on the subject for extra credit. Some students who are struggling in the traditional classroom may engage better with online learning in the MOOC context. Of course, teachers will need to provide oversight and make sure students don’t abuse a program like this. An extra test that is designed by the teacher can make sure the students actually engaged with the MOOC and learned something along the way. One of the great things about MOOCs are how accessible they are – MOOCs that are developed by quality platforms (like the three we recommend) can even be viewed from an app on a smartphone or tablet. This ease of access allows teachers to get creative in how they can use MOOCs in the classroom. For instance, teachers can assign MOOC lectures as homework, and then focus on activities and projects in the classroom. This kind of hybrid approach takes advantage of the best of both worlds – students can take courses developed by world renowned universities like MIT, but they still have accountability and personal interaction with a teacher. If used appropriately and creatively, MOOCs can be a very valuable tool in a teacher’s toolbox. As we mentioned earlier, MOOCs are a great way for high school students to get familiar with career paths and what would be required to get a degree in a specific subject. Teachers can recommend specific MOOCs to students who are self-motivated and really want to prepare for college. MOOCs open up a world of possibility to students who are willing to put in the effort to take advantage of them. There are also MOOCs that are specifically designed to prepare students for AP or CLEP exams. edX is one platform that has quite a few MOOCs designed for this purpose. An example of a MOOC that prepares students for a CLEP exam is "Preparing for CLEP Chemistry: Part 1." There's also edX's MOOC, "Preparing for the AP English Language and Composition Exam," which is focused on AP Prep. We gathered our initial list of MOOC platforms from a variety of Google searches, as well as from the recommendations of other guides or sites that review MOOCs. Credentialing had five different sub-metrics, and we averaged each platforms sub-metric scores together. There were six different scores given out for the core metric “Credentialing” since each platform’s sub-metric average was different. We divided the scores up into six equal parts, which resulted in a difference of 2 points between each platform. We ranked each platform’s average sub-metric score, and then assigned a core metric score based on that rank. We started by collecting research from Udacity’s website to score the sub-metrics in Course Diversity. Udacity has three search filters, which is the second most of all the platforms. However, it tied with another platform offering that same amount. Furthermore, there were two platforms—Coursera and edX—which each tied for the highest number of search filters (6). Because of these groupings, there were only four unique scores from 10 to 0. This means there was a difference of “3.33” between each course. Udacity earned 6.66 along with iversity. 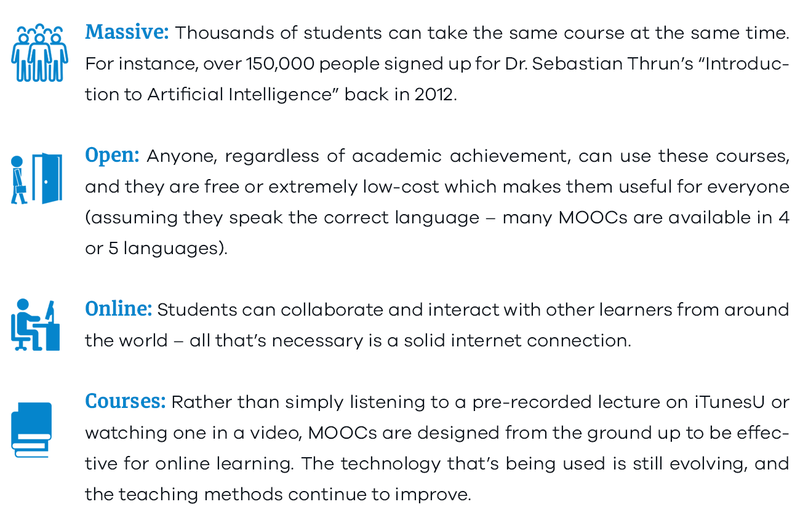 Udacity only offers MOOCs across three different categories of learning (the categories we used are listed here) – that was the lowest, so it was given a “0” in the third sub-metric. Udacity does provide self-paced MOOCs, so it received a “10” in the fourth sub-metric. It also offers scheduled MOOCs, so it received a “10” in the fifth sub-metric as well. The next step was to find Udacity’s sub-metric average for Course Diversity which was determined to be “6.1.” Udacity’s sub-metric average ranked as the fourth highest, which earned the platform a “4” in Course Diversity. Since there were six different sub-metric ranks, there was a 2 point difference between each platform’s score. 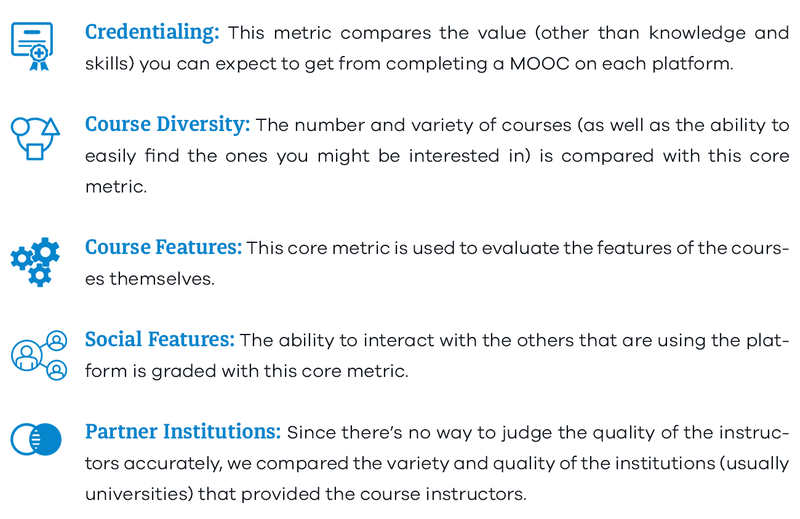 This section takes an in-depth look at each core metric, and explains the importance of its role in determining the overall quality of each MOOC platform. Taking a MOOC is an investment of time and sometimes even money. You can count on getting a return of increased knowledge and new or improved skills, but is there a benefit to your day-to-day life? Does a MOOC help you get a job? Does it open the same kind of doors that an accredited degree does? This core metric addresses the return on your investment – what credentials do you receive after successfully completing courses from each platform? While MOOCs are relatively new and the problem of credentialing is still not fully addressed, there are a few different ways that different platforms have dealt with this issue. One such way is an ID-verified certificate that gives employers some reassurance that the holder didn’t cheat their way through a MOOC. Completing a learning pathway or specialization from most platforms provides a certificate which may become increasingly valuable as MOOCs become more and more recognizable. Credentialing measures the types and number of credentials offered by each platform to give you an idea of how valuable a MOOC taken on one platform may be when compared with a MOOC from another platform. This is why we identified it as the most important core metric. We also looked at the variety of learning pathways and courses with college credit to give you an idea of which platforms had the most MOOCs that were especially valuable in terms of credentialing. Note: The way we determined how many categories a platform has, was by comparing its catalog to the Classification of Instructional Programs (CIP) which is published by the National Center for Education Statistics. We used this core metric to identify what features and learning tools the platforms provide that increase the overall quality of the MOOCs offered on that platform. We also looked at whether the platform gave the students a chance to review and assign a ranking to the courses that they have taken. Most of the questions in the core metric had yes-or-no answers since we were mostly testing whether certain features were present. The only way we could rank the quality of the instructors was to measure the comparative quality and variety of institutions with which the platform partners. We gave this an equal importance to “Social Features” and “Course Features” because if a platform has superior learning tools, but sub-par teachers, the overall quality still isn’t going to be great. Note: We compared each platform’s partnered universities by awarding points based on this ranking. For example, each platform that partners with the #1 ranked university (MIT) got 100 points. Platforms that partnered with the #2 ranked university got 99 points, etc. We only awarded points for the top 100 ranked universities in the world. Each platform’s points were added together, and the platforms were ranked accordingly.